If you’re interested in beautiful buildings, spectacular design and one-off experiences, we’ve compiled a list of architecture in West Sweden that you simply must see. Victoriahuset, as it is locally known, is located on Kållandsö, just north of Lidköping. It was created by the Gothenburg-based White Arkitekter and was inspired by gossamer reeds and drift wood by lake Vänern. The building was designed and built to blend in with its natural surroundings. 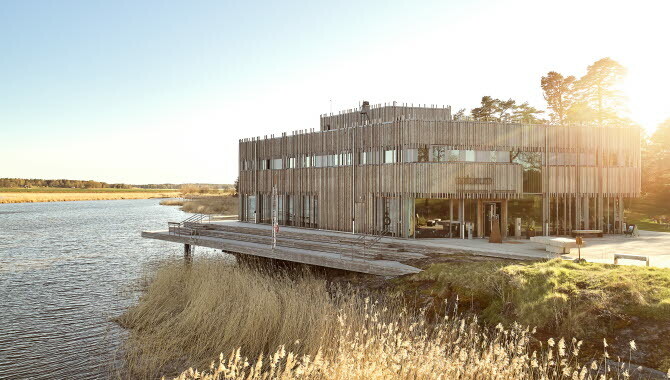 The natural design of the façade continues into Naturum Vänerskärgården, the only Naturum in Sweden with a hotel and a White Guide Restaurant, Hvita Hjorten. 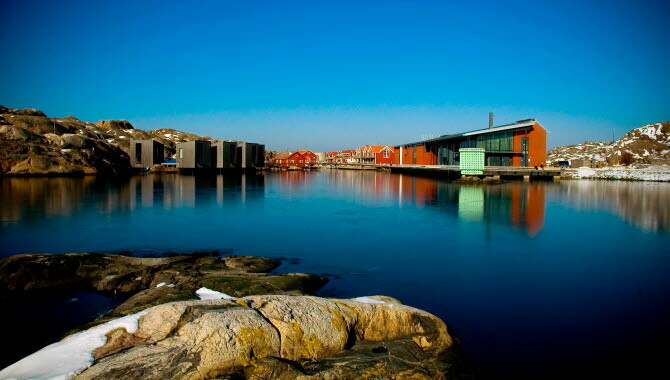 The eye-catching, colourful "Kuggen” is located in the old shipyard area at Norra Älvstranden, Gothenburg. It’s a cylindrical building with triangular windows, named after its similarity to a cogwheel. 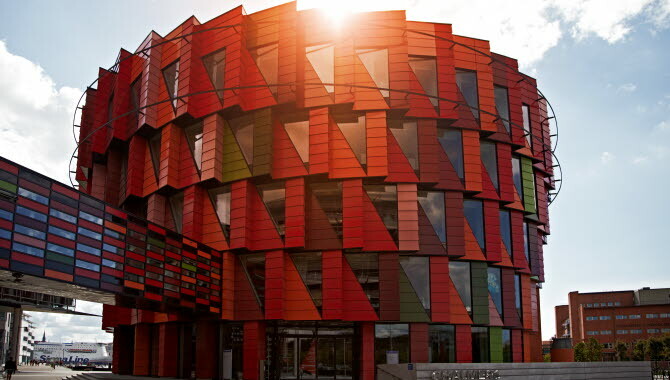 It was designed by the Gothenburg architect Gert Wingårdh and has received several awards for its innovative architecture. Kata Gård in Varnhem is a unique building that covers the ruin of one of the oldest churches in Sweden. The place is named after the woman who ruled over the large farm during the last years of the Viking Age, and the crypt of the church is probably the oldest room in Sweden. 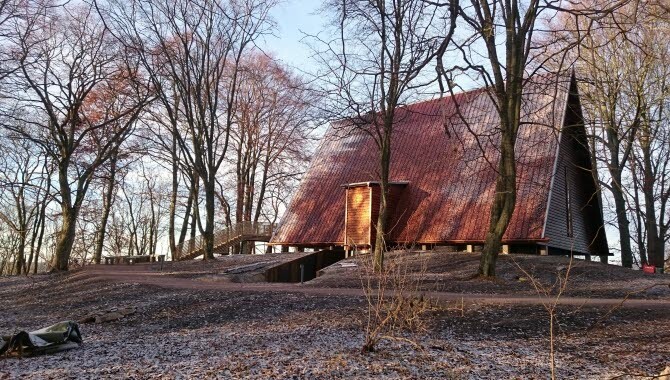 Magnus Silfverhielm and AIX Arkitekter have made a modern version of an old church roof by creating a covering building in wood, 12 by 19 metres and 12 metres high. Under this extraordinary structure you can stroll among the excavations and see the graves. The building has attracted international attention and is in the final of the annual architecture competition, World Architecture Festival. 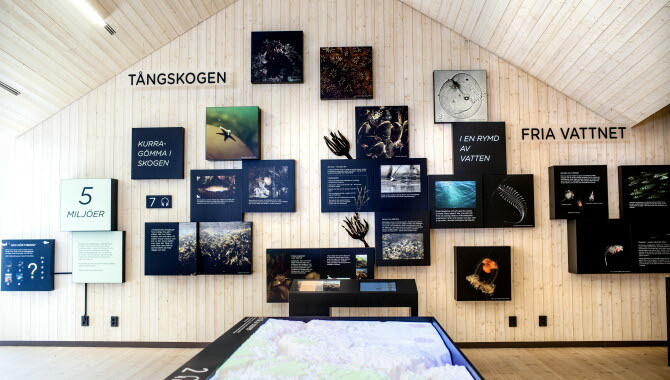 Naturum Kosterhavet is a visitor centre located at Sweden's only marine national park on the island of Sydkoster. 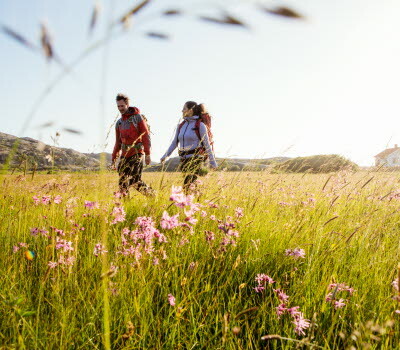 But wait - it has more to offer than just exhibitions, seminars and ideas for excursions. The fascinating modern wooden structure has a natural interplay with the existing buildings and the architecture in itself is well worth a visit. 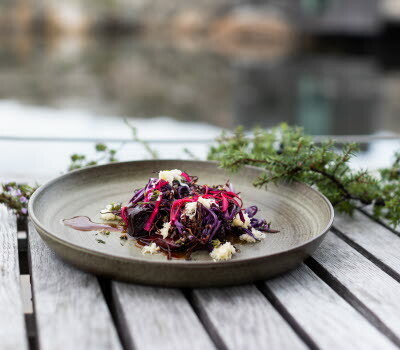 Naturum Kosterhavet is designed by White Arkitekter. Hjo, a town of wooden houses, lies on the west bank of lake Vättern. It has a very special character with all its charming, well-preserved wooden buildings from the 18th, 19th and 20th centuries. 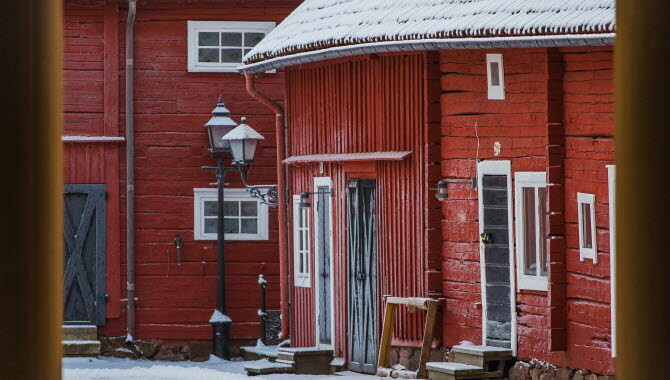 Hjo, alongside Eksjö in Småland and Nora in Bergslagen, is part of the network called Tre Trästäder (three wooden towns) and in 1990 it was awarded the Europa Nostra honorary prize for the remarkable conservation of its wooden buildings. Surrounded by the peace and quiet of Dalsland, you can stay in a glass house under the starry heavens where only nature is your neighbour. The architect behind the glass houses, Jeanna Berger, was inspired by the barns of Dalsland where she used to play as a child. The houses are built on pillars to leave as small a footprint as possible in the environment. 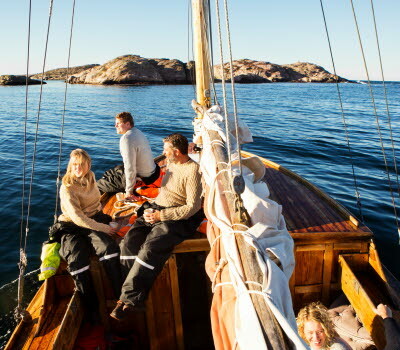 Their design is quintessentially Swedish: unadorned, functional, and built with natural materials. 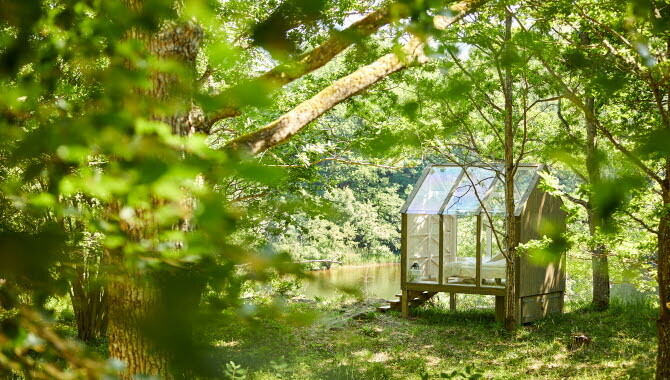 The glass houses were developed through the 72 Hour Cabin project, with the goal of studying the link between well-being and closeness to nature. There are now glass houses at Henriksholm, Baldersnäs Herrgård and Dalslands Aktiviteter, and the innovation has had a major impact in international media, including the largest circulation quality newspaper in Germany, Die Zeit . Universeum was designed by Gert Wingårdh and was opened in 2001. It is a building with many dimensions and was constructed using many different materials. 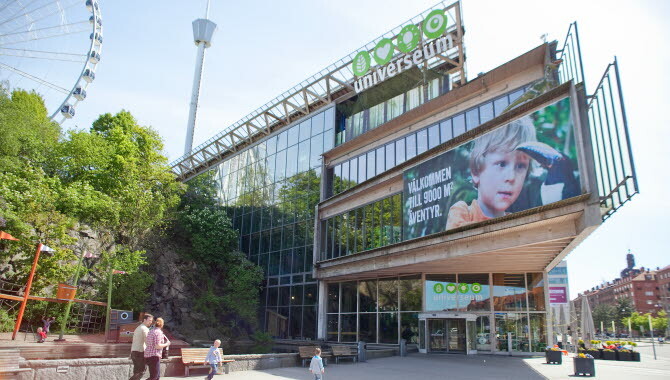 With seven floors of rain forest, exotic animals and exciting experiments to perform, it is the largest science centre in the Nordic countries. The Nordic Watercolour Museum is on the island of Tjörn in the archipelago outside Gothenburg. The building in which it is housed came about through an international architecture competition held in 1996. The winners were the Danish architects Niels Bruun and Henrik Corfitsen. Both beautiful and functional, it is located on the shoreline and has an elemental appearance. Wood panelling painted in red with touches of grey and blue ensure that it blends in well with the surrounding archipelago landscape. 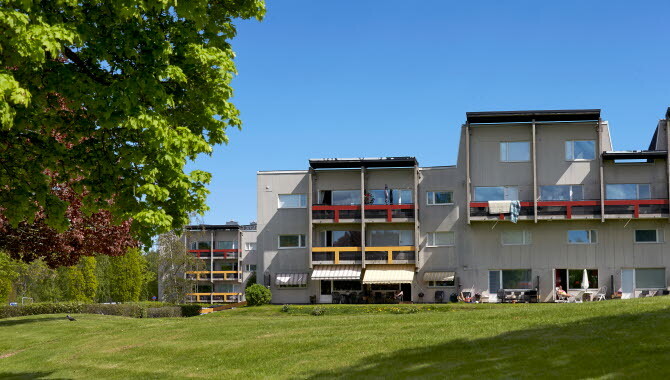 The residential area of Brittgården was designed by the British architect Ralph Erskine between 1959-1969. His dream was to create a community within a community, with a grocery shop, pre-school - and no cars. Erskine wished to provide homes there for all sorts of people, young and old, so he designed different types of houses. The galleries, landscape windows, substantial balcony constructions and asymmetric roof heights were innovative elements. 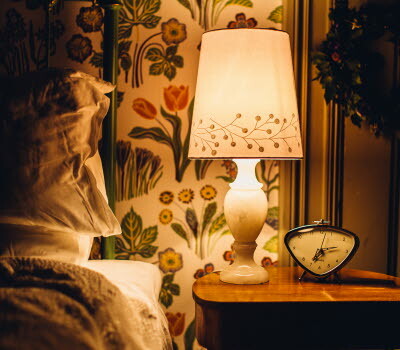 Brittgården became well-known for its architecture and you can now book a guided tour to visit a 1960s style apartment.